The frothy mousse, the tiny bubbles, the fresh and floral aromas, and the rich fruit flavors, accented with that biscuit, yeasty quality that dances on your palate, this is what great French champagne is all about. Then you look at the label, oh snap! French name but an American sparkling wine! And not from California, but New Mexico! 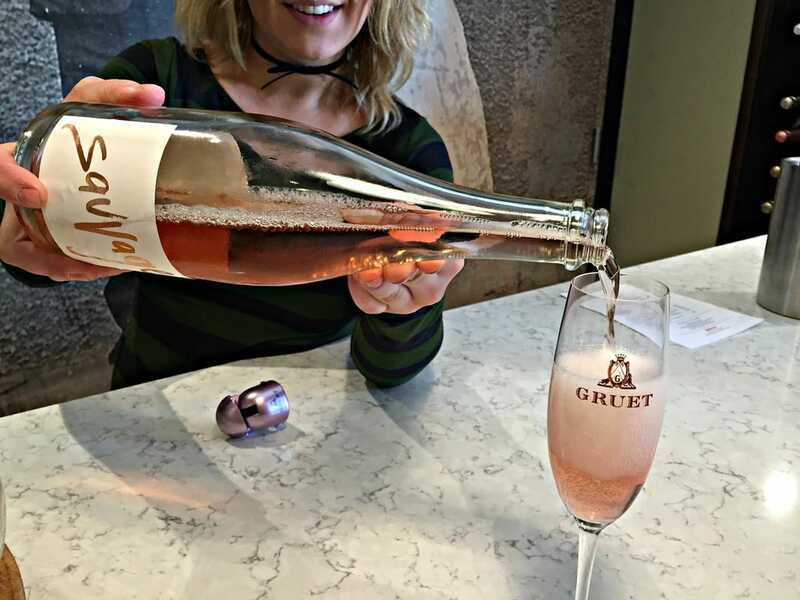 Although most of the state is desert and considered too hot and dry to grow wine grapes for sparkling wine, Gruet Winery has successfully planted high-altitude vineyards of the classic Champagne grapes, Chardonnay, Pinot Noir, and Pinot Meunier. Offering a full lineup of the classic French styles, Gruet has captured the celebratory essence with a Southwest spin, and embodies the state’s logo, “The Land of Enchantment”. Over 30 years ago, in 1983, the Gruet family, looking to expand their winemaking business beyond France, traveled throughout the American Southwest. Discovering ideal conditions for growing grapes in the higher elevation areas of New Mexico’s desert landscape, at 4-5,000 feet above sea level, the Gruets bought one vineyard and contracted with two others to secure enough grapes to fulfill their dreams. Founder and patriarch, Gilbert, sent two of his four children, Laurent and Nathalie, to head up the fledgling winery, with Laurent becoming head winemaker. 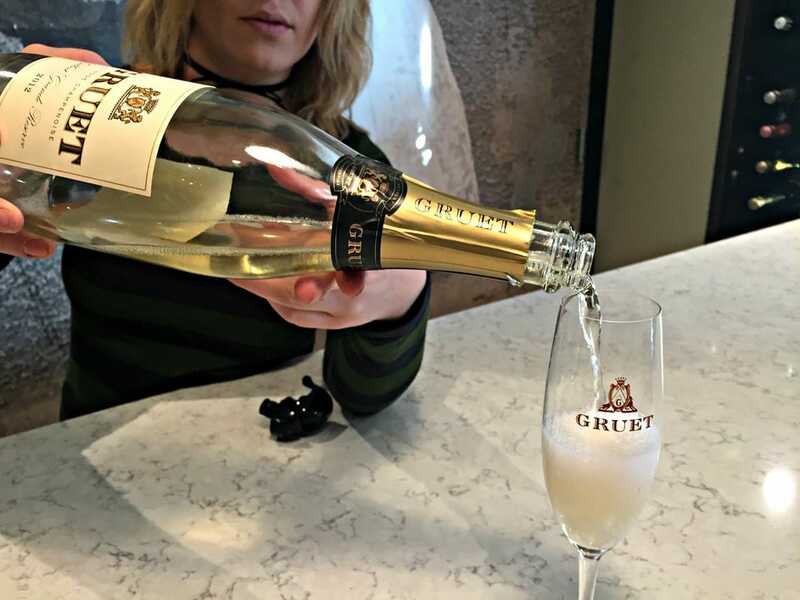 Starting with their first release in 1989 of a Brut and Blanc de Noirs, ten years later, Gruet sold one million bottles in 1999, proving the grand experiment profitable as well. Earning kudos from Wine Spectator in 2011, their Gruet NV Blanc de Noirs was named #43 of the Top 100 Wines of the World, an even bigger achievement considering the wine retails under $20. The novelty of a Methode Champenoise wine with New Mexican roots plus it’s affordable quality intrigued many chefs and wine professionals, adding to the Gruet caché among American sparkling wines. With tasting rooms in Albuquerque and Santa Fe, Gruet attracts lots of visitors, from the casually curious to wine aficionados. In Albuquerque, the L-shaped bar and small tables are perfect for exploring their still and sparkling wines. Different flights are available, but the most popular are the Cuvée Tasting of their non-vintage bottling and the Tête de Cuvée Tasting, the best choice to sample their limited release vintage wines. The Barrel Room, available for special events, showcases oak barrels of wine behind a glass wall, and winery tours are offered. 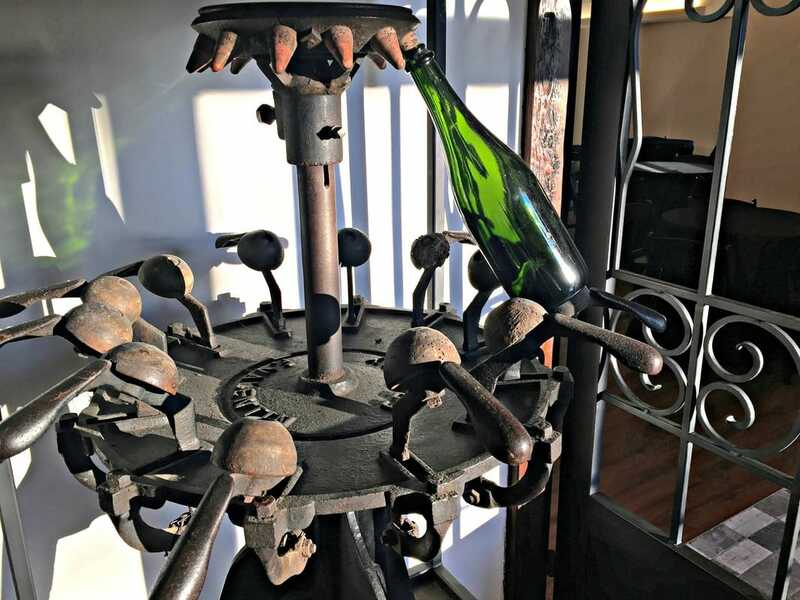 An intriguing display of an antique champagne cork apparatus and historical photos of the founder, Gilbert, are on display while useful and fun wine-themed merchandise line a wall. The tasting room staff are friendly and informative, guiding visitors through their lineup, pulling out vineyard maps and production diagrams to fully answer any questions you might have. On a recent visit, I sampled their Tête de Cuvée tasting, with tastes of their Sauvage and Vintage wines. The Sauvage wines are bright and bone-dry, with no added dosage. The Gruet Sauvage NV, 100% Chardonnay, excites with its green apple and citrus fruit,a bit tart for my taste, but would definitely be good with fatty foods. The Gruet Sauvage Rosé, 100% Pinot Noir, channeled a palate of smoked cherries and wild strawberry, yet still tart, the Pinot adding an edge of richness to the wine. The Gruet Sauvage Vintage 2011 was my favorite, more rich and round due to extra time on the lees. This 100% Chardonnay sparkler’s aromas of brioche and citrus played out on a mineral body, with yeasty and nutty notes, finishing long and lovely. The Vintage wines were a revelation. The Grand Blanc de Blancs Vintage 2011 and Blanc de Blancs Vintage 2012 are both 100% Chardonnay, yet the difference is that the Grand wine is crafted of fruit from the oldest vines, and the Blanc de Blancs, a fresh, lemony, and zesty wine is produced from younger vines’ clusters. The next two vintage wines are dedicated to the founder, Gilbert and his wife Danielle. The Gruet Cuvée Danielle Grand Rosé Vintage 2012, 90% Chardonnay and 10% Pinot Noir, fascinates with it’s delicate mousse, rose petal floral aromas, and cherry fruit and hazelnut flavors. But the Gruet Gilbert Grande Reserve Vintage 2012 was my top favorite, an elegant wine whose 100% Chardonnay was oak aged for 6 months before starting the sparkling wine process. This rich bubbly, in addition to green apple and citrus, has tropical notes dancing on the bright mineral and brioche aromas, which lingers on the palate. A keystone of Gruet seems to be the delicate but persistent mousse and tiny bubbles that all the sparklers possessed. 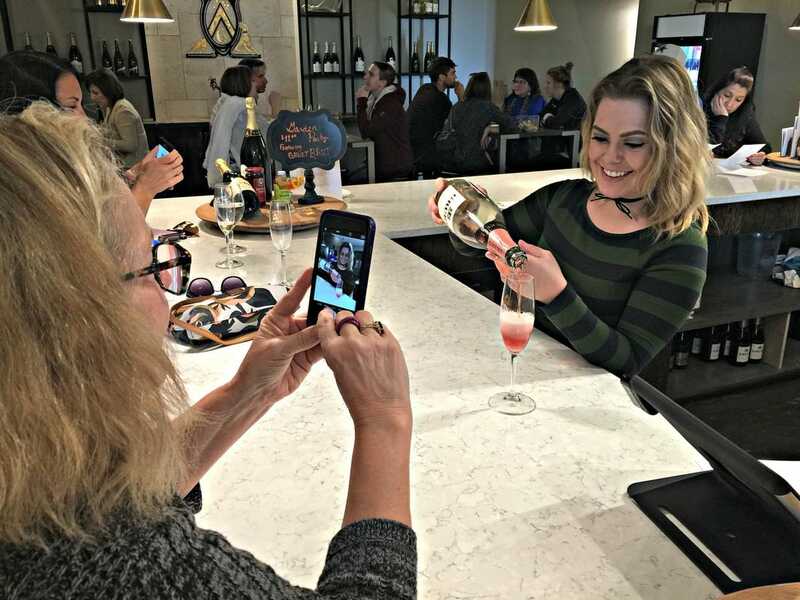 So well-crafted, these bubbly beauties offer something for everyone, with the surprise element, a New Mexico sparkling wine made by a French family, a conversation starter! Award-winning and highly rated, these sparklers offer bang for the buck, and are widely available, a winning formula that will enchant and bewitch all those who sip its charms!